Train Rides are FUN!! : Ride from Barcelona to Paris on a sleeper train Tigger Travels - Family Adventure Journal Photos From Tigger`s Travels and MORE! We knew we needed to get from Barcelona to Paris, the question was how to do it.��We looked at a number of options including flying, renting a car, taking a train and getting another cruise (that was an insane idea). Needless to say, the cruise idea was far too slow for our needs at the time, but you can get a cruise ship to take you out into the Atlantic to a port in France where you can then catch a river cruise up to Paris. It only takes nearly two weeks and A LOT of money!! We then watched the train tickets and saw them fluctuate between $600 US and $2600 US.��We found two great sites for getting our tickets.��One was great for looking up time tables and the other seemed to have better ticketing ordering capabilities.��They are both listed below.��We could order the tickets up to 60 days in advance.��I am not sure, but we may have missed out on really cheap ticket by not being there the moment we could order our tickets.��We ended up paying just over $800 US for the four of us in a sleeper car, but missed a cheaper deal that would have saved about $250 US.��We theorize that they offer only one at the cheaper price because we were in the second sleeper for the whole train and the people in the first got the WAY cheap rate for the same size family. Security at the Barcelona Franca station was tighter than any other station I had seen.��You could only enter if you had a ticket and your bags had to go through an x-ray machine of some kind.��I would image this will get tighter in the future, but this was a very relaxed security compared to the airports.��We were in as fast as we could stick all our bags through the machine. Train stations are big.��If you have never been in one, prepare yourself.��The platforms are generally covered by a HUGE barrel vaulted roof as seen above. All the ones I have been to have ample seating, though at times it can get crowded in many train stations.��To the left you can see we had plenty of space to wait a couple hours.��We went real early; half not knowing what to expect and half because we had to get out of the apartment or we would never get out! The sleeper car was neat.��There were two seats on either side and some of the luggage went overhead.��A while after the train took off, a staff member came by and stuck a key in the wall and four beds appeared.��They were not the Ritz Carlton (not really expecting that) but the train rocked us to sleep very nicely.��In the morning, when you wake up, you just remove the guard rail (it should slide out or move a catch and it folds down) and push the bed back into the wall.��It should snap into place but make sure you have everything out first.��Our neighbors left something in there and had a very hard time getting the crew member down to open it backup for them. Here, you can see the two seats on the right side.��You can also get a good idea of where the beds come from. 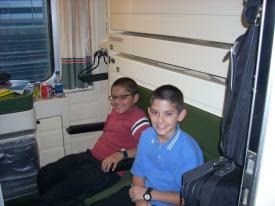 The cabin was great.��You can lock the door.��The curtains close tight with Velcro and snaps.��The train had a nice restaurant car and bar car that gave us prepackaged pastries and manly European coffee for breakfast.��The boys had chocolate milk. 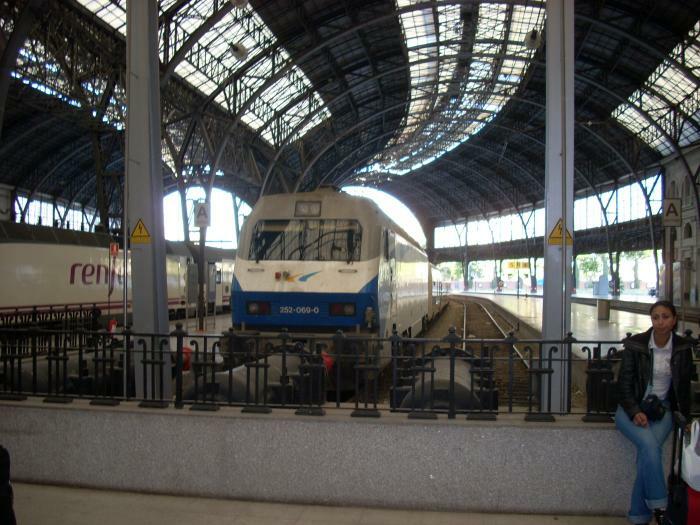 I have traveled a lot on European trains in years past.��I like it.��I recommend an iPod and earplugs if you feel you need them.��Also, I always travel with a few decent sized bungee cords to strap luggage up out of the way.��If you are traveling during the day, bring a book or a desire to watch the countryside go by.��Travel at night in a sleeper car.��The price is generally no different than by seat.��In fact, our train had nothing BUT sleeper compartments in it.��It made several stops throughout the nigh, people got on and off but I don't know where they came from or went once on the train.��It worked nicely though. If you don't mind some dizzying video look at the included video to see out our window. TURN YOUR SOUND DOWN FOR THE VIDEO. IT IS LOUD AND PRETTY USELESS!! Great for train schedules and buying tickets. Great for getting stop details about your train ride. Schedules, etc.